Serve a better-for-you dish without losing any of the flavor with our Seven-Layer Salad Recipe. An alternate version of a potluck favorite, Seven-Layer Salad is layer after layer of classic tastes. Consider yourself, warned, however, it's possible there won't be any leftovers. Layer first 4 ingredients in clear glass bowl. Spread mayo evenly over salad, sealing to edge of bowl; sprinkle with cheese. Top with bacon. Refrigerate 1 hour. Toss just before serving. This colorful salad can be refrigerated up to 6 hours before serving. Top with bacon just before serving. 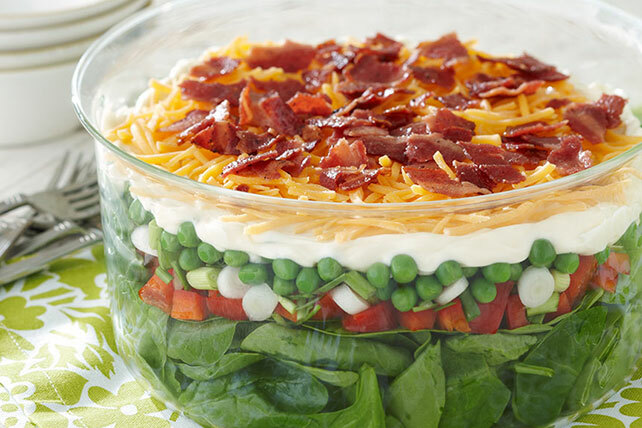 For the best presentation of this colorful layered salad, prepare it in a straight-sided 3-qt. glass bowl. Prepare using OSCAR MAYER Selects Uncured Turkey Bacon.